Why are people not more open to emergency preparedness? Saturday September 28th 2013 we cooked up quite a bit of food for the City of Hurricane, Utah Emergency and Disaster Preparedness Event. I and my assistant (Joyce) got there early to set up and be ready for the 9:00 AM start time. Needless to say the sun was not very high in the sky, so it took a while for the ovens to get enough sun to heat up. We had a very comprehensive menu to cook. Of course we fried up scones again, cooked wheat bread in the Sun Ovens, hard boiled (baked) eggs in the sun oven, cooked meatballs in bbq sauce, baked oatmeal butterscotch cookies, baked a chicken enchilada pie, fried sausage links on the SolSource and cooked a couple of other items, the which I cannot remember at this moment. 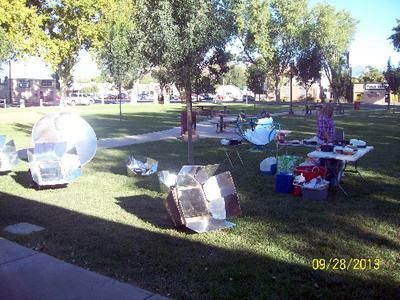 We spoke with quite a few people about solar cookers and gave them samples as well of all that we were cooking . There were not as many people at the event as compared to last years event, mainly because it was not advertised very well for some reason. Sad, because emergency preparedness is something all of us need to work on. Despite the low turn out, we were always busy and talking with people since our display of cookers always seems to be the biggest attraction at these events. There is something about bright, shiny, powerful solar cooking apparatuses with food cooking in them that seems to fascinate people. Maybe people only think about preparedness when the disaster is at their doorsteps. 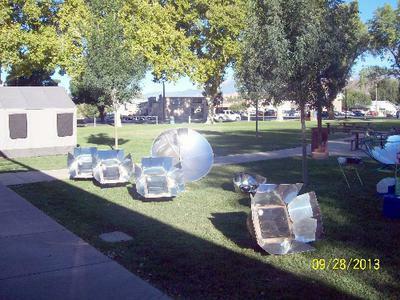 Here in Utah we don't seem to have many emergency events, unlike many of our solar cooker buying customers who live on the east coast and seem to always be experiencing some kind of disaster or emergency. Join in and write your own page! It's easy to do. How? Simply click here to return to Emergency Preparedness links invitation.